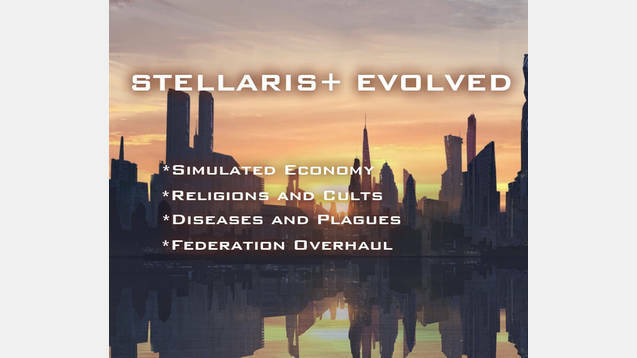 Stellaris + Evolved aims to improve the gameplay by adding more deep and options to various aspects that where lacking in my opinion. Also Compatible with Planetary Diversity! Free Economies: Free economies rely on their civilians to develop their economy, government can’t build industry and the civilian economy will build them instead, but in exchange extra options for civilian interaction are available like taking loans from civilian banks. Corporatocracies: Corporations control the economy and the civilians pay taxes to them instead, but monthly a % of the total value of each existent corporation is paid to the government. Same than with free economies you can’t build industry, instead Corporations use their money to develop planets and other activities like space trade or boosting your research. Also each corporation can be interacted using the factions menu. Controlled Economy: On controlled economies the government has control over the industrial development and the taxes are paid directly to you, civilian interactions are limited and the civiliane conomy tends to be very poor. Some economical policies are limited based on your civics, for example you need to be authoritarian on some degree to be a controlled economy. Diseases will start to show after 10 yearis into the game. The more people live on a planet the more prone they are to disease, so to prevent this you will need to build clinics and hospitals. Plagues are more serious and will start showing after 50 years into the game. There are 3 plagues currently and I’m not going to spoil them, but if you get one a “cure” technology will show up under your social research. After you complete that technology you will have a policy to distribute the cure that will eventually heal your infected planets. After being infected by a plague you can also quarentine the planet to prevent spread, even if it’s not 100% guarantee that it will not spread. Strategic resources are scatered around the planets replacing almost all the sources of resources from vanilla, they work pretty much like betharian stone on vanilla, they let you build unique buildings on top of them. Some of them need certain planet specialization to be built. This makes planets a bit more interesting and the fact that there are actual resources instead of just “minerals” or “energy” adds to inmersion. AI and sectors should be able to identify this resources and build according no what’s in the tile. Based on your religion you will get different bonuses or malus after conquering other religion planets. In the future I will be adding interactable religion factions with reformation mechanics and more deep. Now you will be able to determine how your federation works, how many power the president has and what your federation politics are. Country election – Every member country has one vote. Representative – Every pop living in any planet in the federation votes without government interference. Permanent – The president holds the title forever. There are also several levels of centralization on the federation that unlock laws and federation organizations that need to be paid with a budget gathered from every federation member, every law needs to be proposed and voted depending on the vote method your federation has. Any member can propose a law change every 10 years using an option found under the politics tab. Budget is gathered reducing the resources generation of each member and gives the president influence bonus, this influence is used by the current president to pay for the diferent federation institutios such as the research or the health institute. If you use it with some mod that changes this file one of the two mods WILL NOT WORK. So basically If you are using any mod that causes incompatibility don’t ask me, compatibility questions will be mostly ignored. If any mod author wants to make a compatibility patch or want me to do it, feel free to add me on steam. Thanks to tmonahan23 for his compatibility patch with Ground Combat Evolved and for the feedback and support he has been giving me!